Five hours ago I was convinced that my day would end in a very I'm-going-to-willingly-spend-my-Saturday-night-indoors way when in fact I've not yet embraced my new status of a student away from home, from my friends, in a city that I'm madly in love with but that I don't know in the least. It's probably a lot to take in for a first sentence but this is the most concise way I could explain my past two weeks. However, when I came back home (on campus) a little pack from Amazon was waiting for me at reception thanks to the Express delivery that only cost me 4£ (the advantages of living in London) compared to the normal 11£ I would've had to pay back home. The contents of the pack consisted mainly of school books. 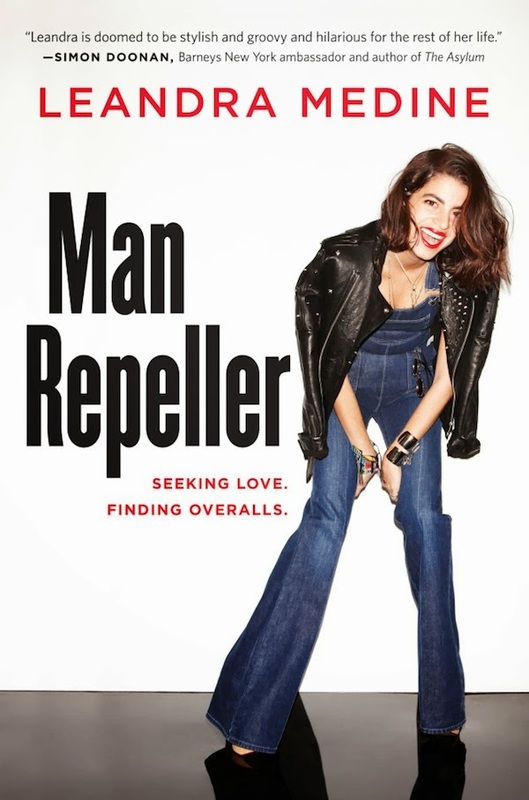 But there was also a little treat I'd indulged in: Leandra Medine's new book: "Man Repeller: Seeking Love. Finding Overalls". Although I don't want to delve into a very cheesy post I do have to admit that her blog and the way she delivers her ideas were my main motivation to start mine. Not for the sake of others, of money or fame but for my own. I love her writing and I was expecting I would love her book too. But I was taken aback because I didn't love it. I was shocked in the best possible way and I couldn't let it out of my hands until half an hour ago. I always associate certain songs or books to people or stages in my life. And there were defining times in my life that just happened to be paired with songs or books that referred perfectly to me and spoke to me in a special way. The night before Freshman Year I listened to "Fifteen" from my newly bought Taylor Swift album "Fearless". I was fifteen, I was hours away from starting high-school and the song was as appropriate as it could have been. I've considered the fact that I might be making these songs or books appropriate to my situation, that I might be modelling them to fit me even though they don't... but I honestly don't think so. Life stories are so diverse but from time to time we find someone that went through exactly the same thing as us. And that is, I believe, one of the most liberating feelings in the world because, in the end, it turns out we are not alone. And tonight there were three paragraphs that I particularly related to in Leandra's book. The real fear is of the future - fear of letting go of what was good, even if it means turning your head on what might be better. Because right now I'm just trying to enjoy the opportunities that I have ahead without letting the fact that I've left my whole life, my best friends and, most important, my family behind affect me. The 242 pages of the book have taken me through the inspirational journey of Leandra's success, convincing me that you should always follow your dreams, that ups and downs are inevitable and in this whole whirlwind the most important thing to hang on to is yourself. He pretended everything was ok, like I was just over him, and he over me. Like we had some sort of friendship. Like he could just call me Lea and text me and ask me to have drinks as friends. As friends! As though we've never been intimate. As though I never decorated his damn apartment with a ninety-dollar orchid. And now he, scum of the earth, wanted to have drinks? Heartbreaks are never easy and being continuously poked by the said heartthrob doesn't make things any easier. Though when I was younger my parents tried to teach me that the real good things in life came free, such as happiness and love, I learned quite quickly that the good things in life came wrapped in orange boxes. Well... just because being a student with high hopes and dreams, and a sweet tooth for fashion isn't easy. When fashion still isn't taken seriously by so many and when the thrills of a new item that you've wanted for such a long while and that you've worked for or want to work for are considered superficial standing up for what you like is not an easy job. So... this was quite a handful. The point is that I really loved this book and I would recommend it to any of you guys as well in the hope that some of you will also relate to it. Or if not, I'd love to hear your ideas, your arguments!